I wrote about a female medical student in Romania in another entry. She came back to Japan during her summer vacation the other day. Acquaintances of her parents got together and had a welcome back party for her, though her parents were on a business trip to the U.S. and were absent. She had just finished her medical practice in a hospital in Bulgaria. I could hear many things about Romania and Bulgaria from her. Almost all of her stories were new to us and enjoyable. The picture shows us together. When Ceausescu was alive, Romania seemed to be just like North Korea. However, Bulgaria and Romania joined the EU in 2007. Romania, along with Bulgaria, might be the poorest countries in the EU now, but they seem to be developing at a remarkable pace. I wish her success in the EU. There must have been some deal between Truman and Stalin when Soviet troops changed course to the South Kurile Islands instead of invading Hokkaido on Aug. 22nd in 1945. The details of the deal are still a mystery. Now I'm going to write about the Japanese Army that defended the Kurile Islands. This army has not been written about in the Japanese textbook of history, but this 6th army group had fought against the Soviet troops on Shumushu island (占守島 Russian name 【о.Шумшу】) and other northern Kurile Islands from Aug. 18th to 22nd in 1945. The Japanese Army had been on a winning streak in each combat. I imagine that these defeats for the Soviets were relayed to Moscow and made Stalin change his mind. That is to say, Stalin must have got to think it would not be easy to invade and occupy Hokkaido. Consequently, he modified his target from Hokkaido itself to the South Kurile Islands and the long-time custody of Japanese prisoners of war in Siberia. It is commonly believed that the Greater East Asian War was over on Aug. 15th in 1945. It's because the Emperor's declaration was issued on this day. It was admirable that the Emperor's order swept across all the battlefields in the chaos of the war, but we should remember the war that started after the declaration. It was a real defensive war. As soon as the initial report of the invasion of Soviet troops was brought to Lt. Gen. Kiichirou Higuchi in Sapporo, he ordered the island to be defended, even though it was after the declaration of the end of the war. Responding to his order, the Ikeda tank regiment started firing back. Their blistering counter attack was beyond the Soviets' expectations. This regiment bought time and Hokkaido was saved. If this regiment hadn't been in the Kurile Islands, what would have become of Hokkaido? I don't want to imagine it. Many Japanese people and some people in the Congress visit the Yasukuni Shrine every Aug. 15th. I'd like to advance a suggestion that we should change the visit date to Aug. 22nd. Then the Prime Minister can explain the reason. If this was done, I hope that many Japanese people will come to think more seriously about the defense of the country. Thirdly, Russian amphibious operation against Hokkaido actually came into practice and operational units showed up off the shore of Rumoi City, which is located on the west coast of Hokkaido. If Stalin hadn't changed his mind, Hokkaido would have easily been occupied because the U.S. Army wasn't there to deal with the invasion. However, something happened on Aug. 22th and Russian troops stopped landing and changed their course. They headed for the south Kurile Islands round the north of Hokkaido until early on 23rd in order to occupy those islands. 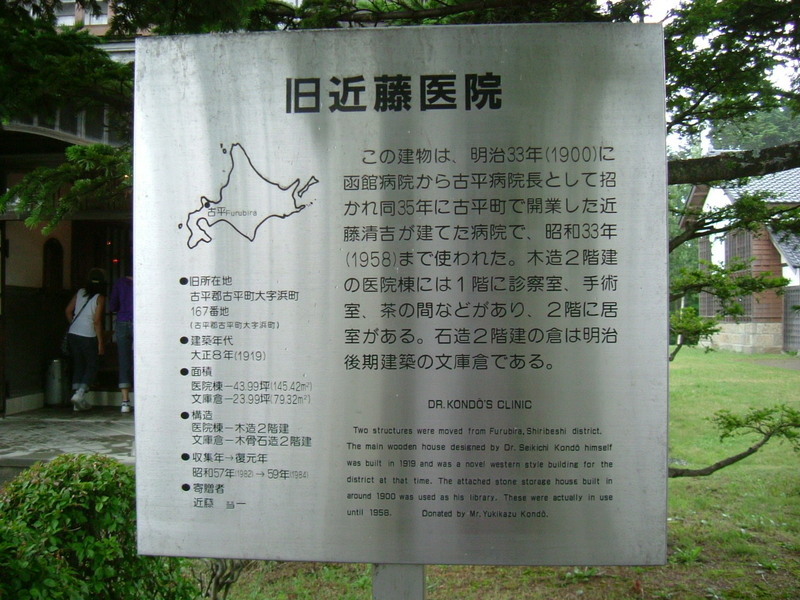 Besides, on the same day, an illegal order was issued, which imposed a tragic blow on Japanese captives. More than 600,000 Japanese war prisoners in Manchuria were promised to be sent to Japan in the Potsdam Declaration, but they were sent to Siberia for forced labor. No doubt these two policies have something to do with each other. What made Stalin change his mind? It is still a mystery. Russian military action against Japan continued until Sep. 5th and they finally ended up occupying not only the south Kurile Islands but also Shikotan island and the Habomai islands, which belong to Hokkaido. Next time I'm going to write my opinion about Stalin's change of mind. Japan surrendered unconditionally to the U.S. and its alliance and World War Two ended on Aug. 15th in 1945. This is written in the Japanese textbook of history. The Atomic bombing was meant to end the war as soon as possible. This is the word of Truman against Japan. To my surprise, the Japanese Minister of Defense said the same thing and caused a controversy this summer. Even the Japanese Minister of Defense is brainwashed by U.S.-planned education. I couldn't believe my ears. See also this entry. I'd like to insist that Japanese must learn about the modern history of Japan, China and both Koreas. The textbooks should be based on secure evidence. Secondly, while the U.S. stopped fighting at noon on Aug. 15th, Russia issued an order on Aug. 18th to occupy the northern half of Hokkaido (north of the line connecting Rumoi City and Kushiro City) and the southern half of the Kurile Islands by Sep. 1st. It was the payback of Stalin. He demanded that Russia should occupy that area on Aug. 16th but Truman sarcastically refused. In other words, Russia's request to occupy Hokkaido was issued on the day after Aug. 15th when Japan surrendered. The atomic bombing couldn't have been the reason for the Russian request. This blog system is designed to be able to know how the visitors came. About a hundred subscribers access regulary now. They usually drop in directly by inputting the url of my blog in the browser window like Internet Explorer. To my happiness, the number of unknown people is increasing now. They came to my blog via some search engines like yahoo, google etc. They put various key words in the window of the search engines. Key words that were most used are the name of places. I am lucky to have written my travel memo on this blog. Some people were collecting information for their trip to Japan. It was a great pleasure to offer what they wanted. Today (Aug. 22th) of 1945 is the genuinely last day of the Greater East Asian War (the Pacific War). I think that this story will become long and I'm going to separate the whole story into three, four parts for a few months. I'd like to write about how the war ceased. Many American people are taught incorrectly in their schools. I'll show you three items of evidence. At first, no matter what the real intention of the top officials of the U.S. was to use the atomic bombs, it couldn't prevent Russia from joining the war. Russian denunciation of the neutrality pact with Japan (Declaration of Hostility against Japan) was done in a hurry between Hiroshima and Nagasaki. 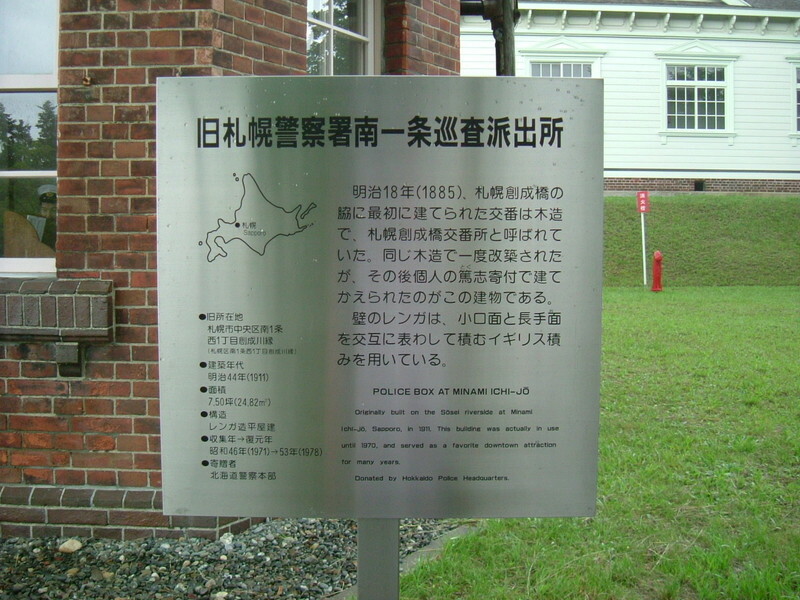 Aug. 14th Japan accepted the Potsdam Declaration. The Greater East Asian War (Pacific War) is supposed to be over by this Emperor's declaration. Even if only from this point of view, the atomic bombing seems to have set Stalin's blood boiling and made him go to war against Japan without hesitation rather than discouraging him from joining the war. During the meeting in Potsdam Stalin was informed that the U.S. had succeeded in the development of the atomic bomb and Russia was dropped from the Potsdam Declaration. It is thought that these double animosities seem to have made him harden his resolve to occupy Hokkaido. The U.S. was supposed to drop the atomic bombs to stop the war earlier and prevent Russia from joining the war. Can it be an acceptable remark for the bombing in Nagasaki after the Russian Declaration of Hostility against Japan? A. Today is the anniversary commemorating the end of the war. The Defence Minister of the time, Mr. Fumio Kyuma, mentioned an inaccurate comment about the atomic bombs on Jun 30th that were dropped in the residential area of Hiroshima and Nagasaki at the end of World War Two. This comment has become an unwanted controversy in Japan. Japanese people are sensitive to topics about World War Two. Not a few politicians ended up resigning due to their own comments about the war. I'd like to present my opinion for a change. B. China and Both Koreas accuse Japan of its colonial policy. Although the Japan-China and the Japan-South Korea Peace and Amity Treaties were signed after World War 2, Japan has been accused by China and South Korea even after signing those treaties. They insist that Japan didn't pay enough compensation money to them and Japan didn't demonstrate enough apologies for things that Japan had done during the war. Besides, nowadays they have brought up the issues of Comfort Women and the Nanjing Massacre. I have secure, irrefutable evidence on those issues. I'm going to show them in my blog for a change though it is not easy work for me to describe them in English. By the way, I have a proposition that Japan, China and South Korea get together at the same table with their own evidence. Such a conference hasn't been put into practice yet. Why? It's because these countries would end up arguing the legality of the Tokyo Tribunal of War Criminals. What on earth did the class-A war criminals do who were sentenced to life in the trial? I wonder what evidence made them guilty. I believe that the most cruel person during the war was U.S. President Harry S. Truman. I'll write about the atomic bomb in another entry, but I want to write here about only one thing. I'm treating two of his numerous victims now. He is inflicting great suffering on innocent people now. Do you think the Tokyo Tribunal of War Criminals could be vindicated? C. We Japanese should insist on our own opinions. I have used English mainly in reading medical papers published abroad. Those papers were written for medical workers all over the world and I had to get the latest knowledge from them. The English education that I received in my student days has been grossly one-sided. Teachers emphasized how to understand English. I think such education was not good. We have to learn not only how to understand other's opinions but also how to express our own opinions. We Japanese should insist on our own advocacy. Hypothetically speaking, two people who have these virtues will dispute with each other. What do you think is the result? I assume anyone can imagine. As I wrote in the following entry, my father-in-law passed away and was put in the ground in January. However, he is in his house today. I'm not kidding. It is the season of Bon Festival. You may think it is strange, but people don't visit their anscestors' tombs in this season, because their anscestors aren't there but in their former house now. In Buddhism, dead people are supposed to come back to their former house during the Bon Festival. 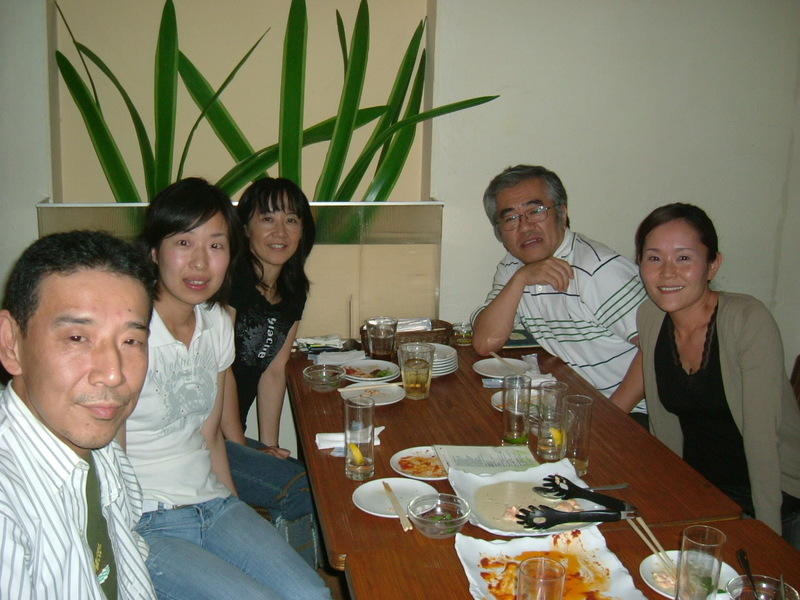 Many people go back to their hometown in this season and share time and space with their anscestors. It causes serious traffic jams across the country, but I think it is an important traditional event in Japan. All generations of people in communities enjoy seeing each other and dancing the Bon Dance during the Bon Festival. My whole family visited my wife's original house today to attend the first Bon Festival for my father-in-law. Representatives of like 20 households around got together in front of the family altar, prayed to Amida Buddha for him and talked mainly about him over tea. This event, I think, strengthens the relationship in the neighborhood. The Bon Festival naturally has a religious meaning, but additionally children are looking forward to this season because they can see their cousins. I returned my car to the car rental company. The company's driver took us to the airport. Shin-Chitose Airport was very crowded. It might be due to the high season now. We bought something for the rest of my family and the staff members of my hospital. There were many kinds of packed lunch. Hokkaido is rich in food. It was not easy to choose only one pack. We passed through the security check a little earlier than usual because the airport was so packed and I thought it might take a lot of time to go to the boarding gate. At the boarding area we had one hour to go and I was hungry. I couldn't wait for boarding and ended up opening my lunch box. My lunch was a barbecue lunch. I got a glass of beer at the stand. I can't imagine a barbecue without beer. I put the noise cancelling headphones on again for the return flight. At that time I tried to talk with a CA with this headphone on. I could listen to her voice clearly. Besides, to my surprise the conversation from the seats in the back row reached my ears with clarity, even though the passengers in the back row were talking at a low volume. It was because this headphone erased the noise. You know, I couldn't help overhearing! After taking a short rest we left Lake Kuttara and got on the highway for Chitose City, where Shin-Chitose Airport is located. 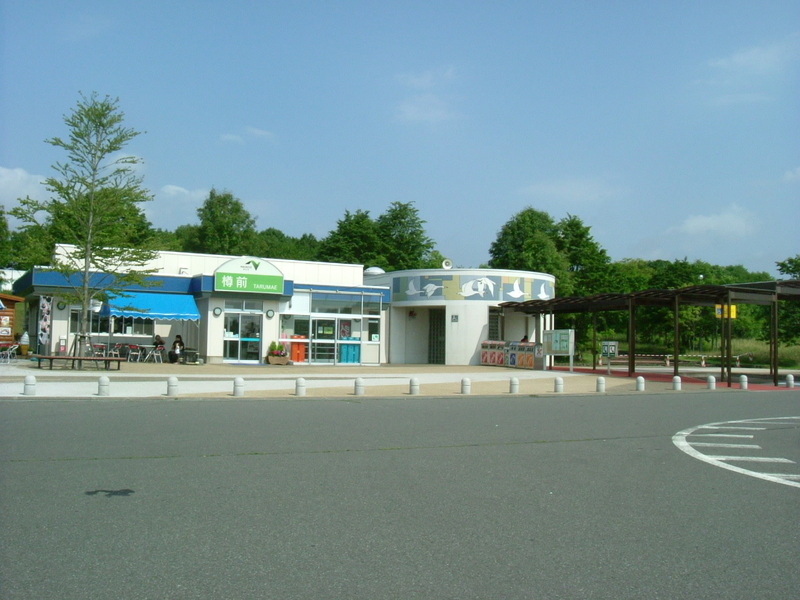 The picture is Tarumae service area where we took a rest on the highway. We could see the magnificent view of the Pacific Ocean just in front of us. It was a totally bright sky as was the case every time I visited Hokkaido. Every time I stay in Hokkaido, more than 80% of the days are cloudy or rainy and only the last day was literally clear. I used to come home with painful reluctance every time. 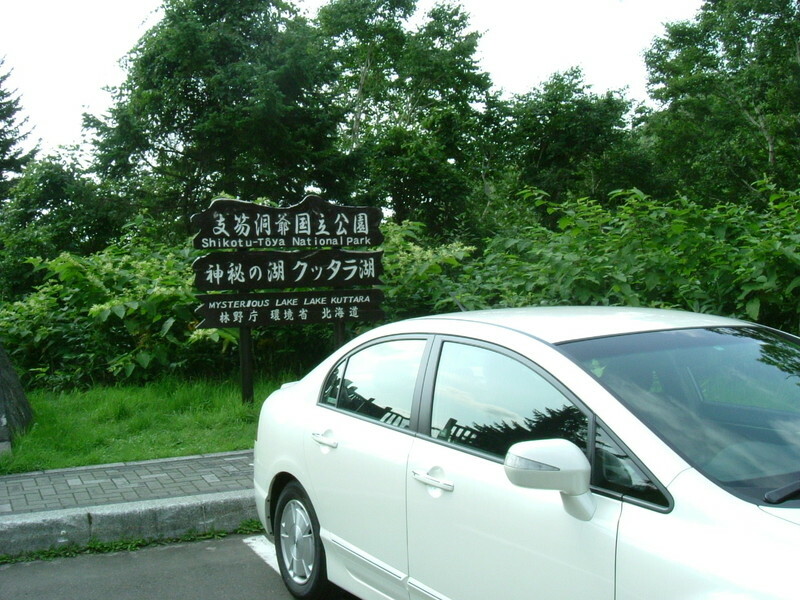 By the way, our car, a Honda Civic Hybrid, demonstrated a very good performance during our trip; Jammed Sapporo City, a winding road over Nakayama Pass, a highway, , , the gas mileage was 18km per litre (42 mile per gallon). When I stopped the car for even a moment, its engine stopped. As soon as I stepped on the gas, the engine quickly started. It was amazing and I thought it was effective for saving on gasoline. Next time I buy a car, this car would be one of the choices. A was eating an ice cream here too. This trip was planned for her. What feelings did she have to see Hokkaido University? I feel she received an intense impression from the University. The huge city, Sapporo, surrounded by a rich natural environment must have given her motivation to learn veterinary science here in Hokkaido. We made for Lake Kuttara next, which is called the mysterious lake. I have wanted to see it since a long time ago. I pulled my car over in the parking lot and took pictures. 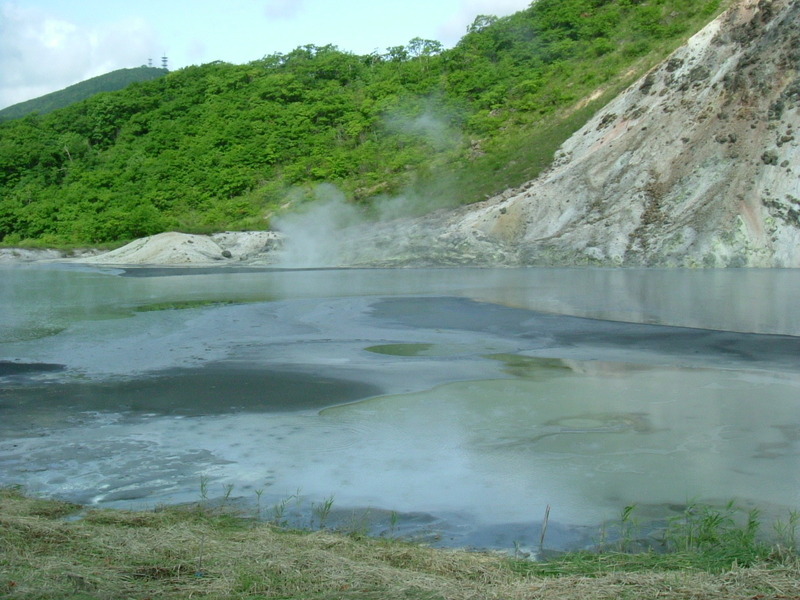 As the 2nd picture shows, this lake is a caldera lake that was formed by volcanic activity. When we got to the lake, we didn't see the other tourists. The staff members of a boat house were preparing for their business. I went down to the water's edge. This is the closed area which has no rivers that empty into this lake. The outer rim of this lake is beautiful. I've sometimes gone out touring with my motorcycle to see such caldera lakes. 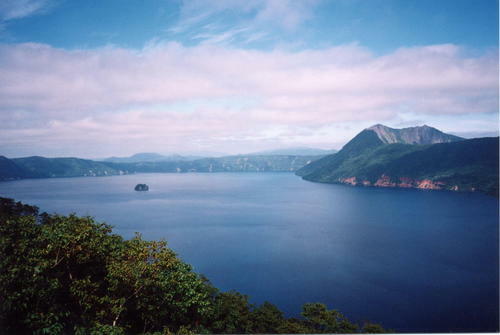 This picture shows Lake Towada. This picture was taken last year. You can see two peninsulas poking out from the lake in the picture. This lake is noted for its beautiful autumnal leaves and many sight-seeing ships cross the lake. The depth is 327 meters and it's the second deepest in Japan. 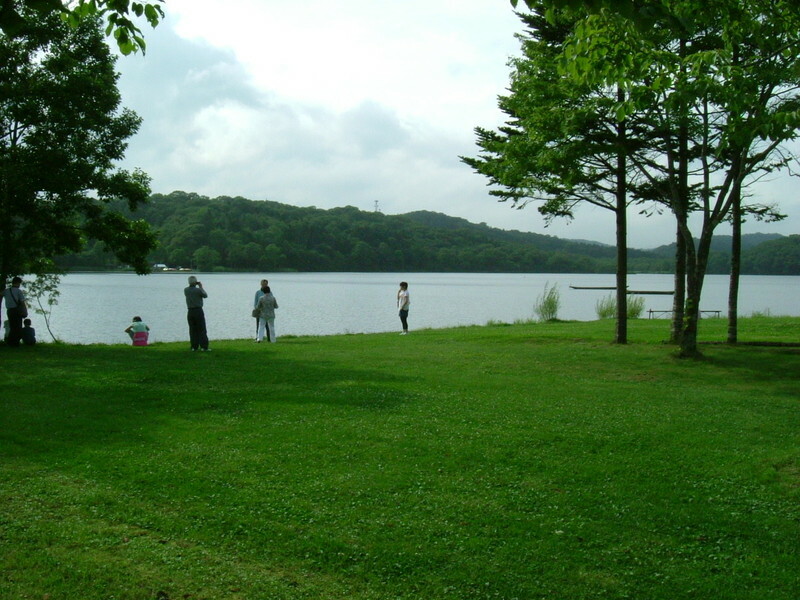 This picture is Lake Mashu. 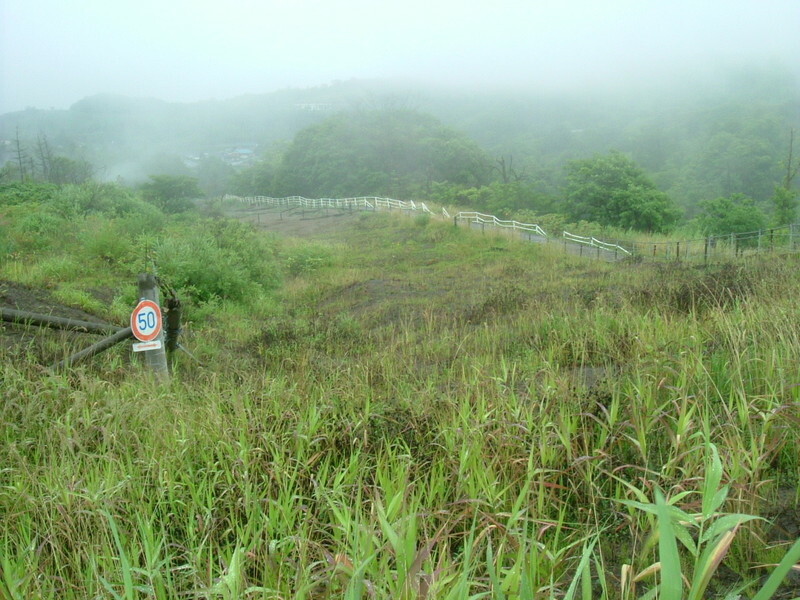 People are prohibited to get on the inside of the ridge of the outer rim to preserve the conditions. It is only the reserchers permitted by the Ministry of the Environment that can access the water's edge. This picture was taken in 1997. This lake is famous as a lake of mists, but it was fine when I visited. The last three pictures were downloaded from some of the sites on the internet. If you can use Google Earth, find the lake at latitude 42. 00' north and longitude 128. 03' east. 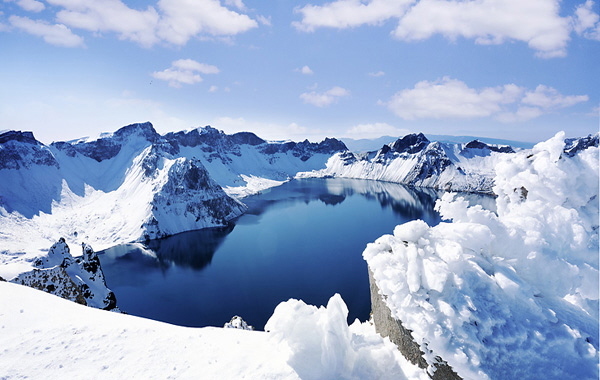 The name of the lake is Heaven Lake at Baekdu Mountain (Pektusan, 백두산, 白頭山). 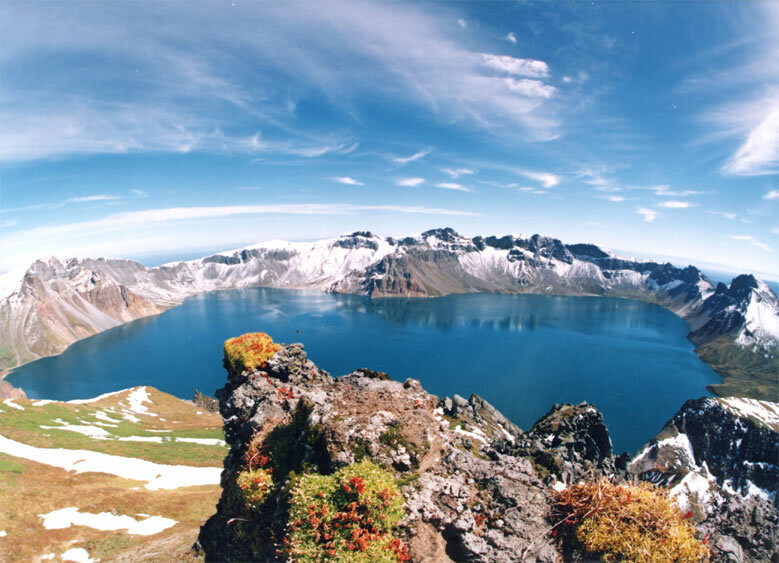 This mountain is located at the border between China and North Korea, and so is very far for Japanese people. I can't believe that China and North Korea could keep their national structure as it is for such a long time from now. I hope I can visit there freely. When the 38th parallel disappears, I'm going to ride my motorcycle around the Sea of Japan. I'd like to drop in at this lake at that time. 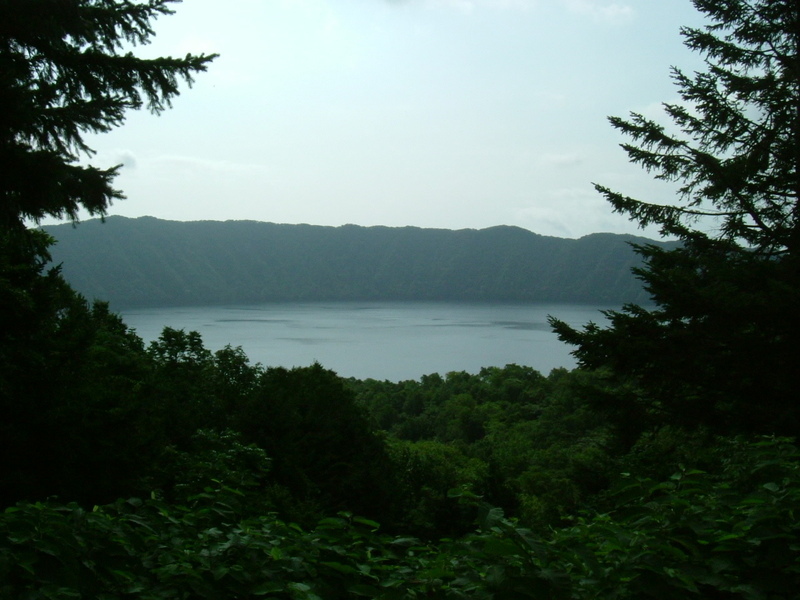 Find and survey these lakes (Heaven Lake, Lake Mashu, Lake Towada, Lake Kuttara) on the map and you will feel these lakes are like brothers or sisters. In ancient times, when the activity of volcanos was more active than now, the borders of countries didn't exist. Don't you think so? After seeing the exhibition in the visitors' center, we got back to our car. The air coming out of the air conditioner was comfortable for our burned skin. We started for Ohyu Numa Lake. After about 10 minutes' drive on the winding road, we got to Ohyu Numa Lake. 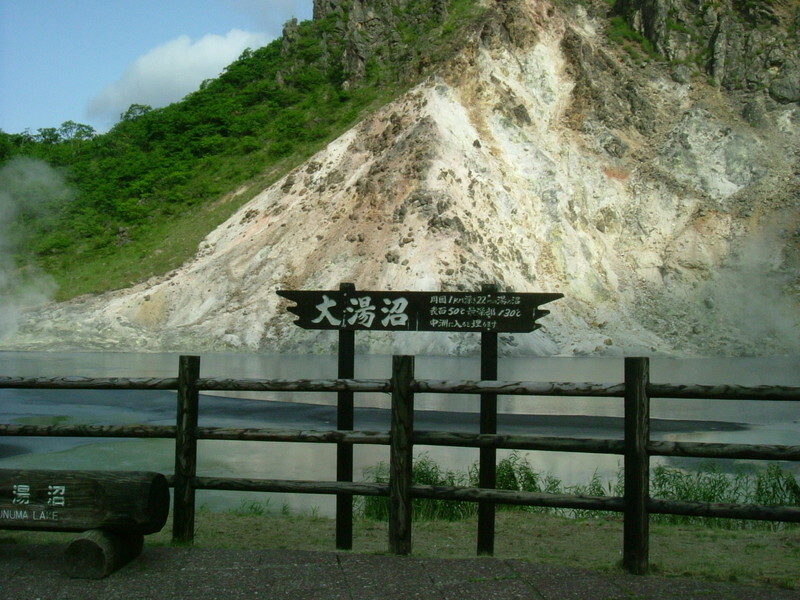 The signboard says that the temperature of the surface is 50 degrees Celsius and the deepest portion is 130 degrees Celsius. I thought I could cook a soft-boiled egg here. You might think it is quiet and peaceful from these pictures, but the smell of hydrogen sulphide was strong. You can see the lake steaming up. I wish I could pipe this water to my house as it would save the energy bill. Is that a poor man's mentality? This is a small pond adjacent to Ohyu Numa Lake. The size of it was smaller than that of Ohyu Numa Lake, but the temperature of the water looked higher than Ohyu Numa Lake. I took this picture more closely. It was too hot and it was impossible to get closer to this pond. I took the picture of Ohyu Numa Lake from a little higher point. There are some hot springs around here like puddles in the forest. The first person who found this lake must have been so surprised to see it. After breakfast and checkout from the hotel, with our car parked in the parking lot of the hotel, we took a walk around the hotel. The signboard says "地獄谷" in Japanese. The pronunciation of it is "Jigokudani". 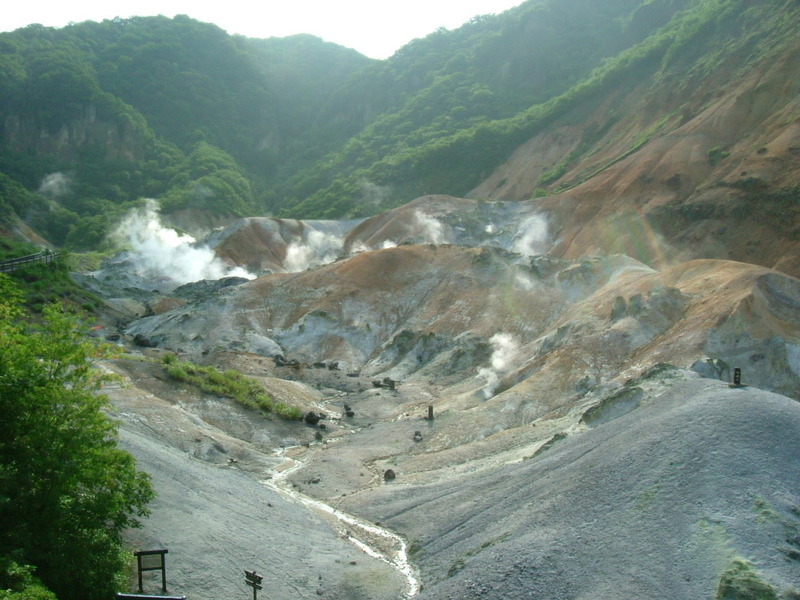 The first two characters, "地獄 (Jigoku)", mean hell and the last, "谷 (Tani)", means the valley. No one has been to hell and there aren't any witnesses of hell, but many people imagined what the real hell must be like here. Therefore the statue of Enmadaiou that I wrote about in the previous entry is here in Noboribetsu. It seemed to need a half day to walk the whole walkway, so I chose the shortest walkway. 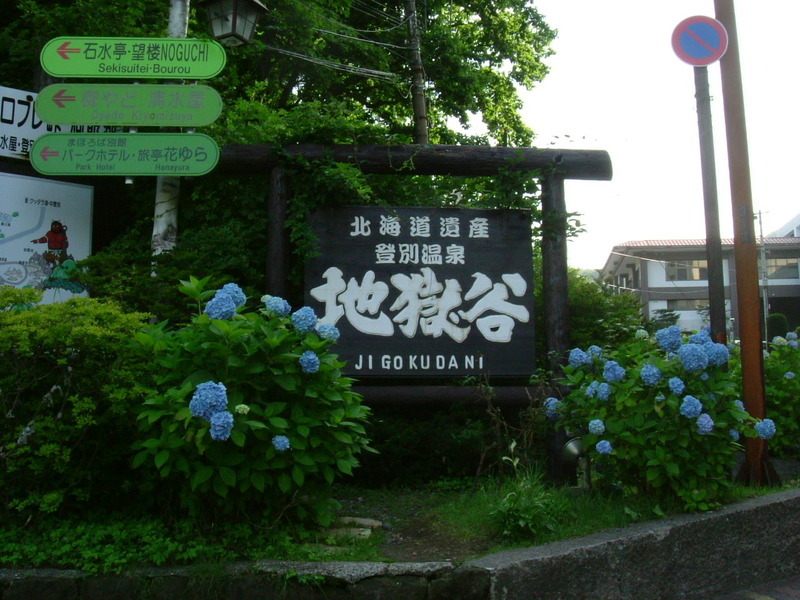 It's a full view of Jigokudani. 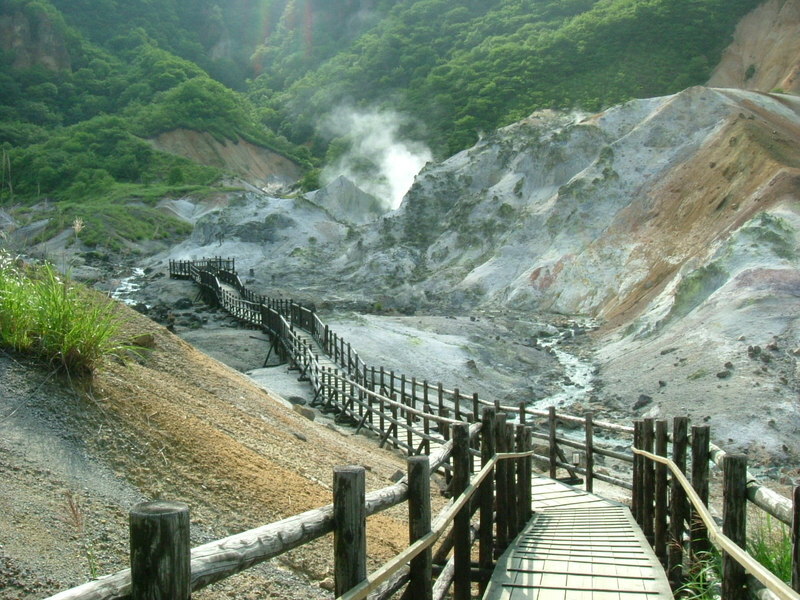 As we got close to Jigoku (hell) it was getting hot. This area was lit up last night and looked fantastic. I could see it from the open air bath last night. It was very relaxing to view the illuminated Jigoku over a mug of beer. My daughter said, to her sadness, that she couldn't look at it from the women's bath. The women's section must be heavily guarded from peeping. You can see the secure gush of hot water closely. We went and saw it. It was so hot. Eighty degrees centigrade water is flowing outside the fence. If you touched it accidentally you would get seriously scalded. This was taken from the walkway. You might think it is quiet and peaceful from these pictures, but the smell of hydrogen sulfide was strong. My daughter, A is walking in the picture. She was always away from me. A is going into the visitor's center. 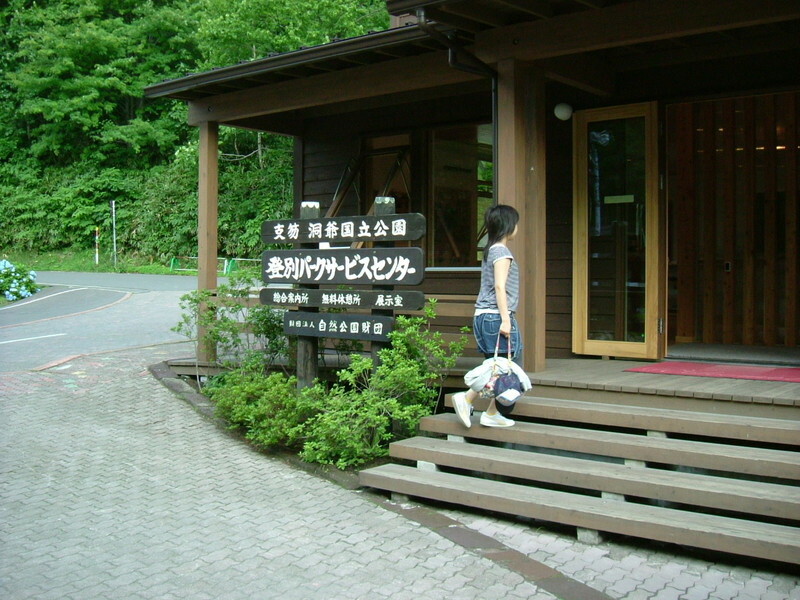 We left Porotokotan and made for Noboribetsu Spa, which is one of the most popular hot springs. 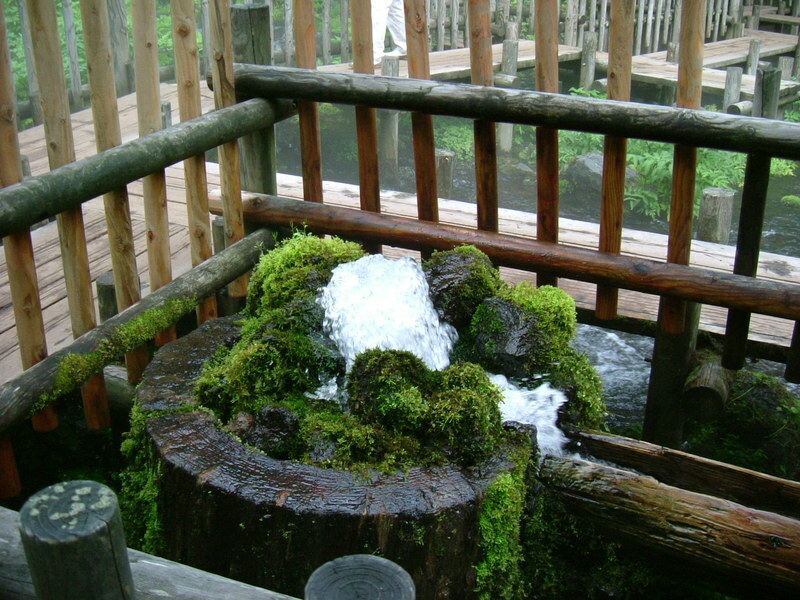 "Betsu" of Noboribetsu means "river" in the Ainu language. 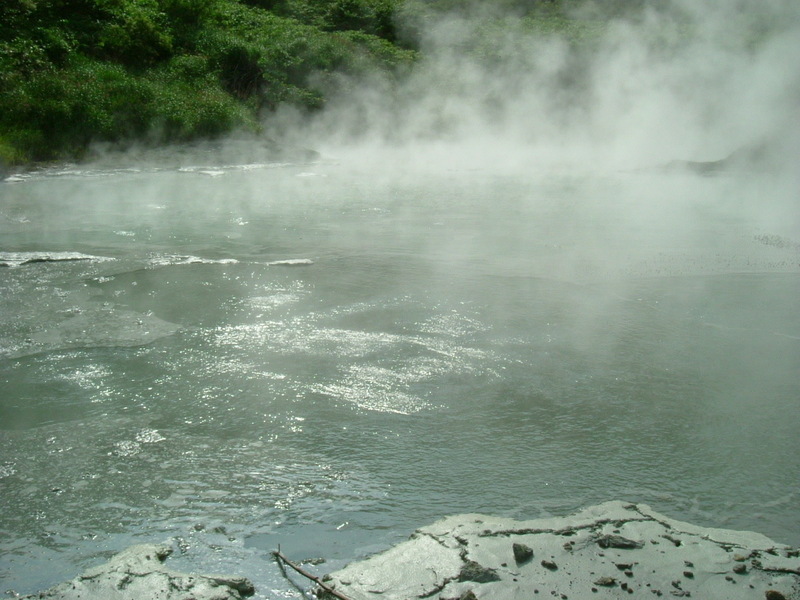 I imagined that the Ainu named this area after seeing hot water flowing in the river. As I was thinking of the things of centuries ago, I drove the car for about 30 minutes on the highway and got off at the Noboribetsu IC to go to the Noboribetsu Spa. 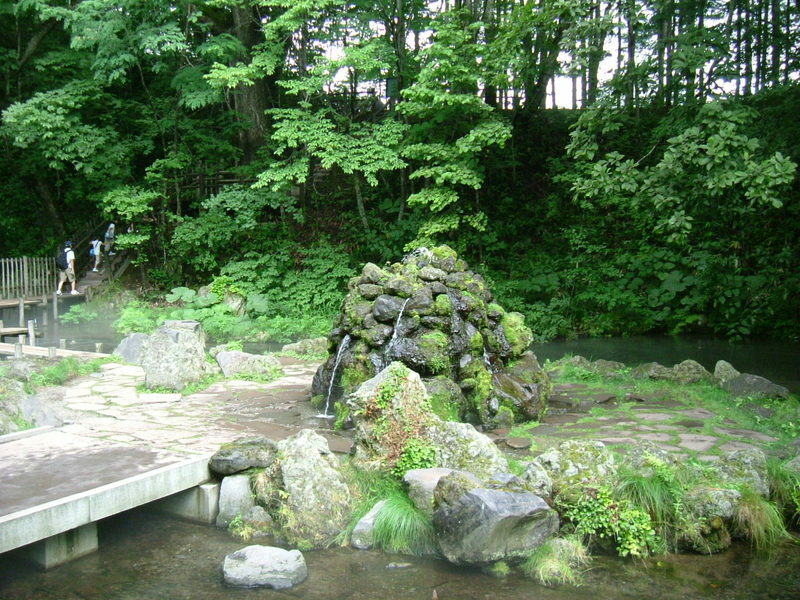 Noboribetsu Spa is also noted for having several kinds of hot water. Various kinds of hot water come out at the same area. 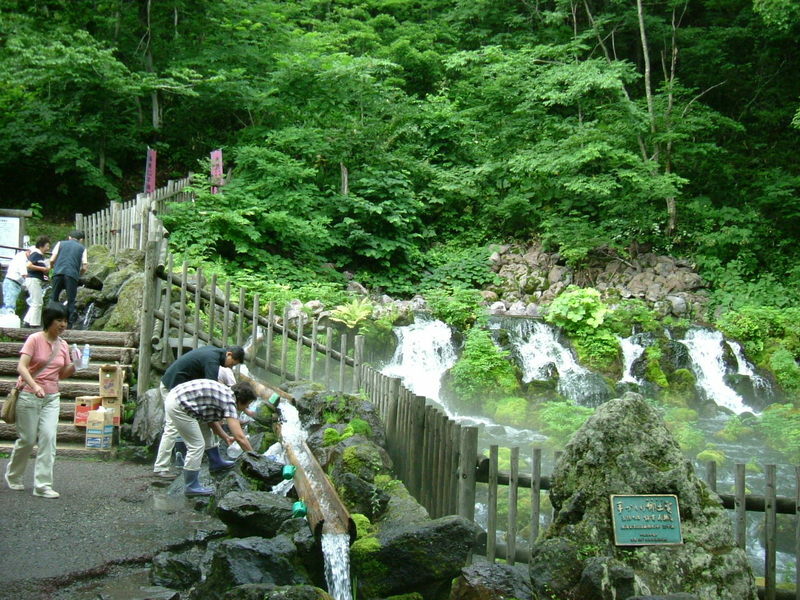 Japan has many hot spring sites, but such a spa is not common. 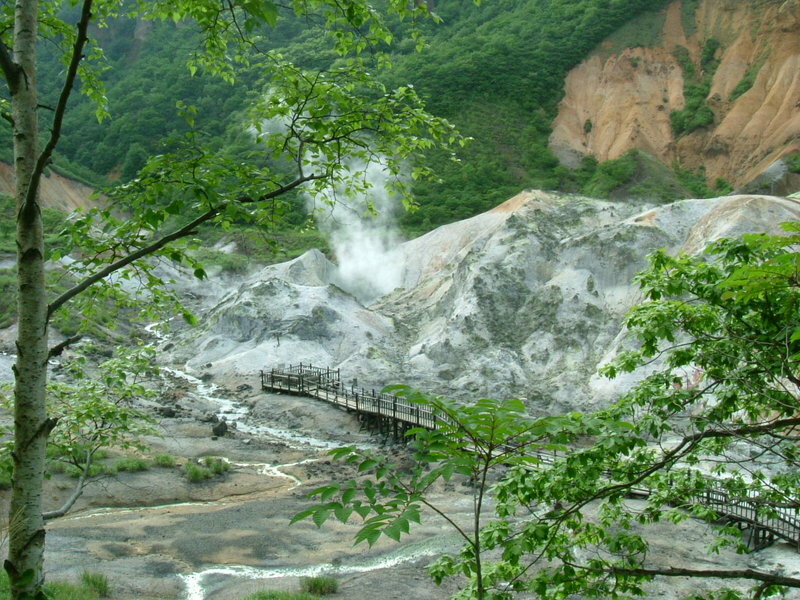 Almost all of the tourists who visit here are looking forward to soaking in these hot springs. As soon as we arrived at Noboribetsu Spa, we checked into our hotel, Takimoto Inn. This hotel was a small western style one and its common bath room seemed to be average. You might wonder why I chose such a small and ordinary bath. It was because this hotel has a sister hotel that was very big and fancy and the customers of Takimoto Inn could take a dip in this gorgeous hotel. Understand? Yes, I was going to reduce our expenses. My plan was successful. Dinner and breakfast in our hotel was very good and we could enjoy a relaxing soak three times in the sister hotel. Let me explain the Japanese style of common bath. Firstly, people take off their clothes in their room and put on "Yukata", a so-called Japanese style bath robe, over their underwear and go to the common bath with their own towel. The common bath is strictly separated into two. One is for men and the other is for women, but mixed types are sometimes seen. One thing, if you email me I can suggest some mixed hot spas, but in this type of spa you must be a gentleman if you are a man and follow the rules. People soak in the same bath tub with no swim suits. The biggest bath tub that I experienced could accommodate 200 people at one time. By the way, I have a sad story about bathing in Canada. When I visited Whister in 2002, I met a black student who was at a loss on the easiest ski trail. He twisted his knee. I reported his position and status to the officials at the ski lift and notified his condition to his friends who were waiting for him at like 5 km down. That night, two of his friends visited my condo and said "Thank you" with a crate of beer. They were gentlemen and looked intelligent from their beautiful English. My ski fellows and I wanted to have a party with them and invited them the next day. The moment I said, "We have a fancy open air jacuzzi. Bring your swim suits! ", I felt that one of them got shaken up. I came to understand his attitude the next day. When 4 Japanese and 5 Blacks got in the bath tub, a group of Whites went out. Their behaviour was not good to us. Our group was not men only. A Japanese and two of 5 black students were women and I was sure that we didn't look like gangsters. One of my black friends asked me whether I had seen the black swimmer. He continued that he didn't want to be born as a black. To be a black is not my responsibility. Is being black a bad thing? I've sometimes heard that the U.S. is like a melting pot of races. I'd thought that it was true. However, since I heard his story, I've thought that the U.S. is a mosaic of races, never fused, never melted. Getting back to Noboribetsu, most Japanese don't mind different races. Even if you are black it doesn't matter. You can enjoy the Japanese hot spas. Yesterday's TV news told that a dozen "Okami," who are female managers of Japanese style traditional hotels that we call "Ryokan", visited Thailand to promote Japanese tours. The TV broadcast showed a scene of how to bathe in a hot spa in Japan. Though I don't know much about Thailand, the Thai people seem to have no custom to bathe together with many people. Even so, they could enjoy Japanese hot spas. I hope many Thai people visit Japan. The pictures show the judge, "Enmadaiou," living in the afterworld. 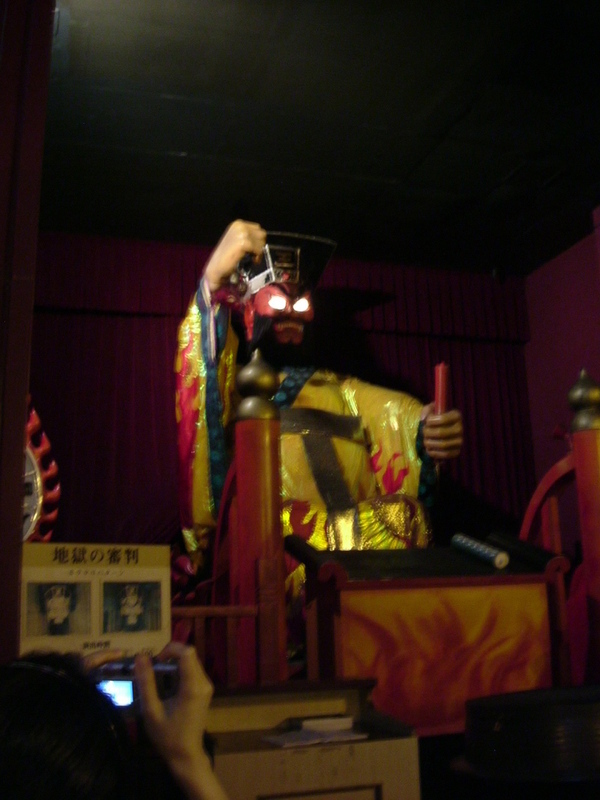 In Buddhism, people are supposed to stand in front of Enmadaiou after death and be given sentences from him. He decides who should be sent to heaven, who to hell. 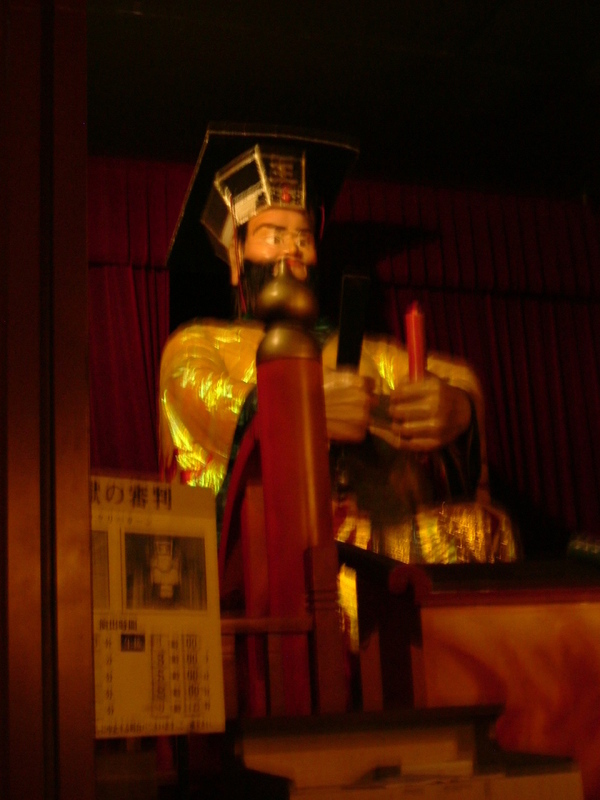 This statue moves on the hour from gentle face to fearful one and his right arm smashes the table with anger directed towards the people. This is a kind of attraction for the tourists. By the way, why is he here? The answer will come along in the next entry. Wait for a few days! As mentioned above, he was accused of not knowing about the Ainu. Lots of critics told of the Ainu living in Japan and it's not good that the Prime Minister didn't know about it. The Ainu was also mentioned in the fundamental primary school textbook of history and I had heard of the Ainu. 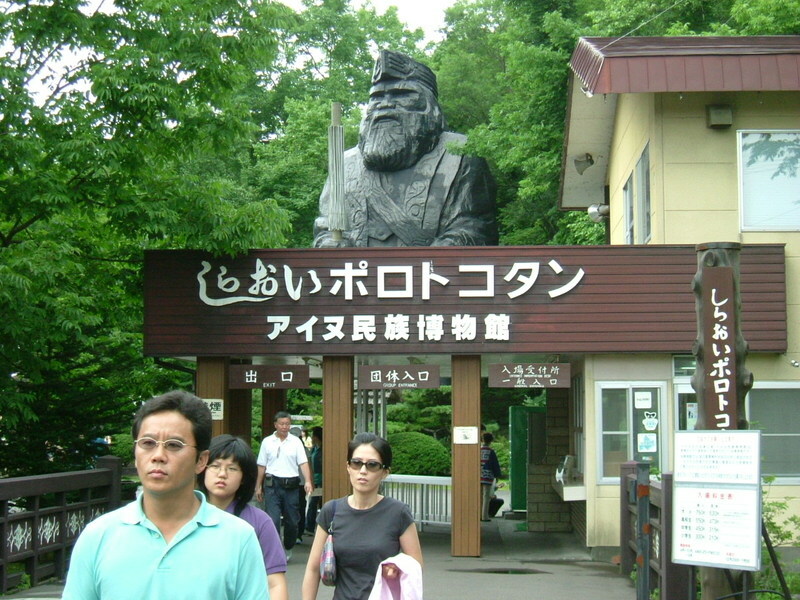 I thought it was just a history, however, I was surprised to know that Ainu is alive and exists today. Ainu is one of the northern peoples. They were living on the eastern coast of Russia, Sakhalin, the Kuril Islands and Hokkaido since far before the Japanese went to Hokkaido. That is to say, they were the indigenous people of Hokkaido. 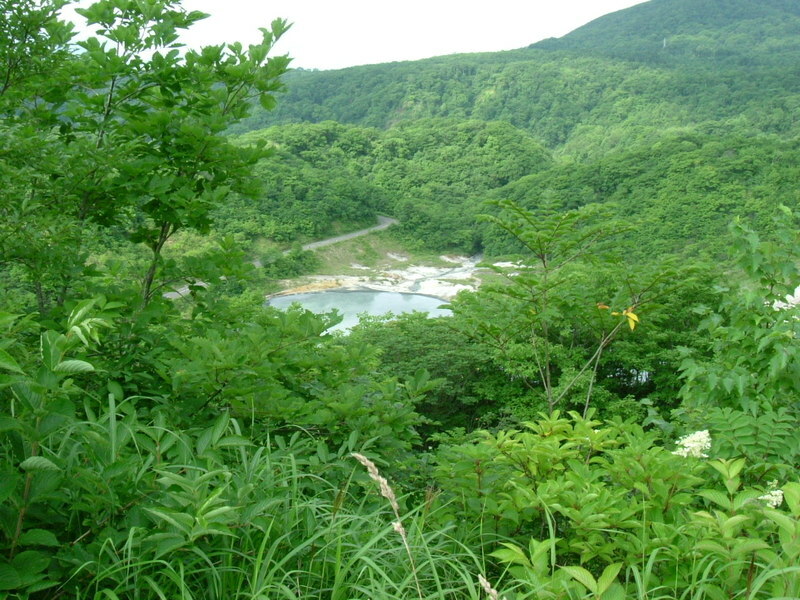 Old records reveal that they lived in the north of Honshu (main island of Japan) too. According to the story from a guide to POROTOKOTAN, the Ainu and Japanese got mixed at least before the middle of the Edo era. The guide was an eldery gentleman who looked to be in his early 70's and he seemed to be the 6th generation of the mixture of Ainu and Japanese. I heard lots of things about the Ainu from him. 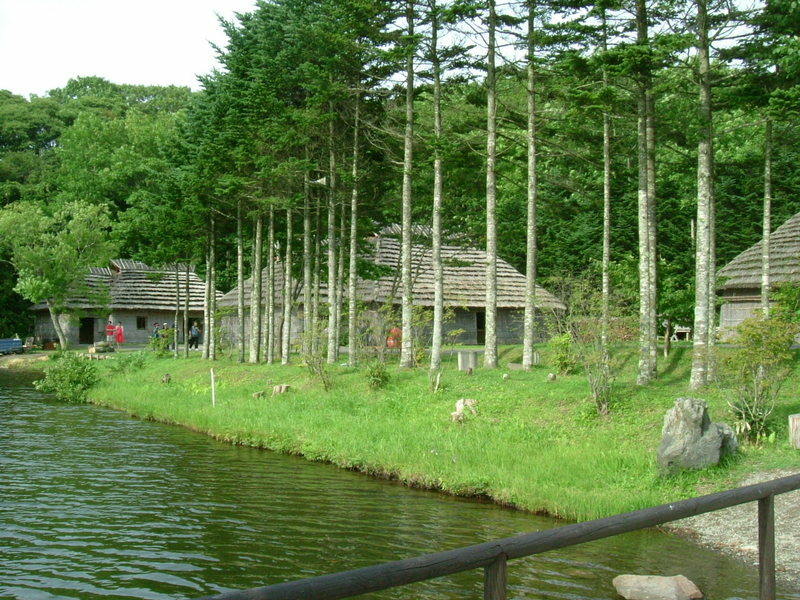 I imagined and expected to be able to see the Ainu village here at Porotokotan. 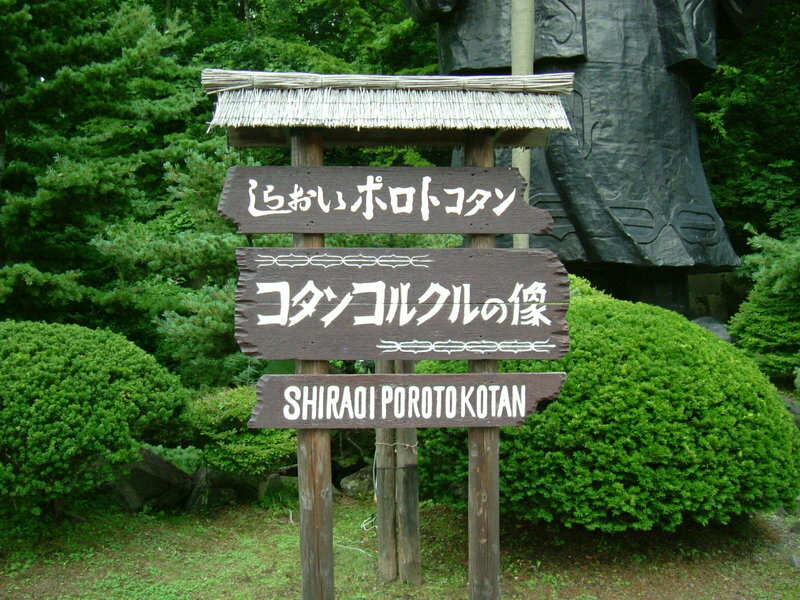 In other words, I took Porotokotan as a real Ainu village. However, it was just an illusion. The real Ainu, leading a quiet Ainu life, don't exist now. Porotokotan was just a museum or amusement facility though I'd like to see a real life presentation like that of the Amish. I was disappointed that there is no genuine Ainu life now. Even young people who have Ainu ancestors don't use the Ainu language in daily life and they work hard to learn it just to preserve the Ainu culture. A dozen employees of Porotokotan wear the ethnic costumes and entertain us, but they live as Japanese outside Porotokotan and put on the native dress only during their business hours. At this point Mr. Nakasone's comment that I introduced at the beginning of this entry was not totally wrong. Ainu is almost completely fused with Japanese now. I took more than fifty pictures here for the rest of my family. I chose and show you some of them. At first, let me explain the name Porotokotan. More than 90% of names of places in Hokkaido are named from the Ainu language. "PORO" of Porotokotan stands for big. Likewise, "TO" means lake and "KOTAN" means lakeside. Totally, Porotokotan means the lakeside of a big lake. I think you know the biggest city in Hokkaido is Sapporo. "PORO" of Sapporo means "big" too. 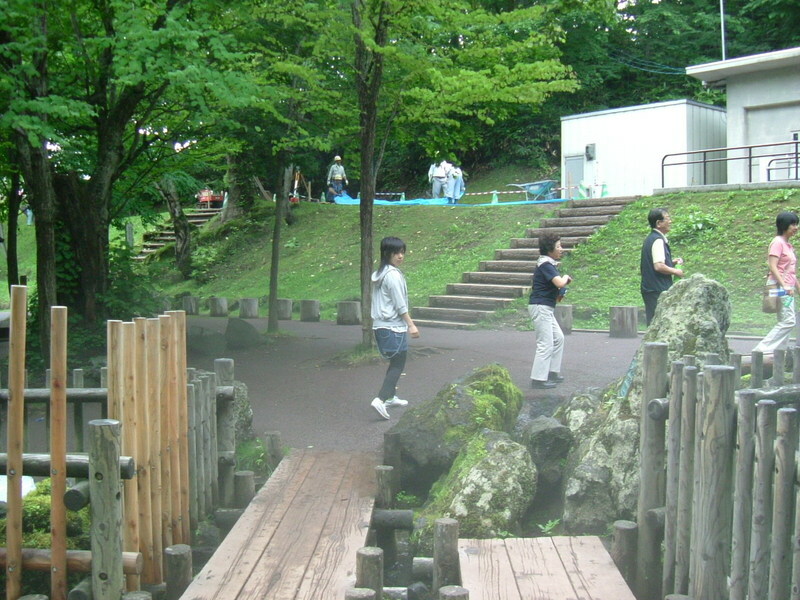 This picture shows the entrance of Porotokotan. Tourists have to go through the shopping street to get here and the same going back to the parking lot. When I walked here on the way to the entrance, I was going to buy something for a souvenir on the way back, but I didn't get anything here when I returned to the parking lot. I heard in the museum that there are no Ainu leading the Ainu life. That means,,, who made these folkcraft articles? I didn't ask this question there, but the folkcraft must have been made by machine, not by the hands of Ainu. My digital camera is old and doesn't have a wide angle lens. I'd like you to see the huge sculpture in the 1st and 2nd pictures. I couldn't shoot the whole image in one time. I think you can imagine how big it was, compared with the size of the people. You can see only the base of the sculpture in this picture. 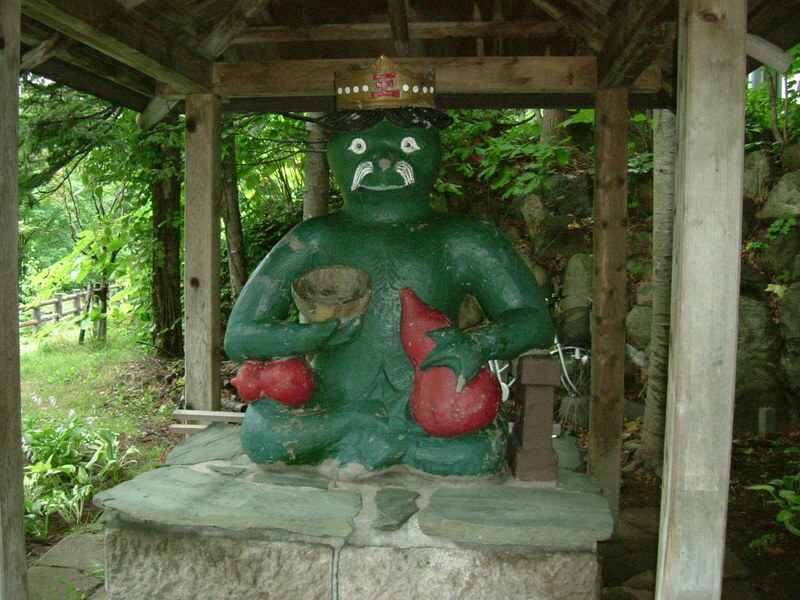 The sculpture is a kind of God for the Ainu and was built praying for the happiness of all the visitors. The climate of Hokkaido is extremely severe, especially in the winter. Winds must have been so strong. Did Ainu people have the technique or method to build such a big and strongly structured house? I asked this question to my guide. He replied that these houses were not built by Ainu people and were of no importance historically. It's just for the exhibition and performance. 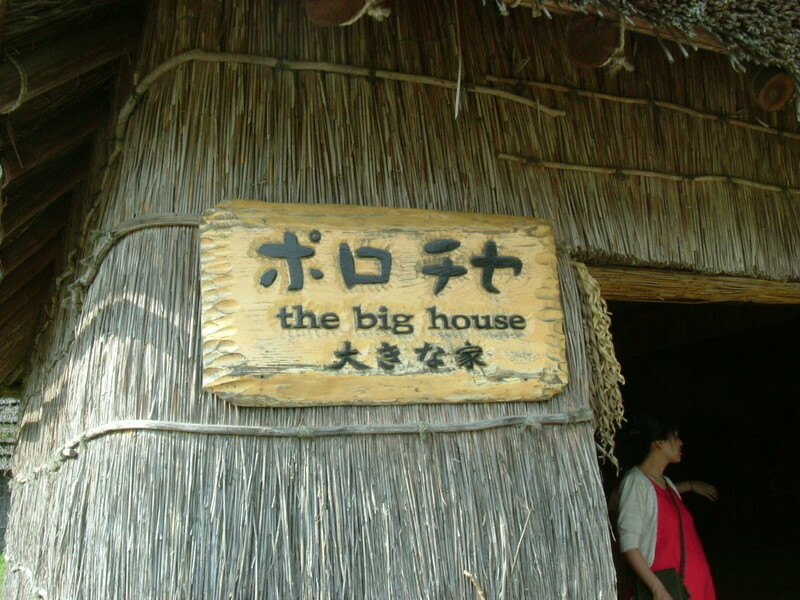 The size of the houses seemed to be more than ten times as big as the real Ainu houses. This is the entrance of one of the houses. The name of this house is written in three languages on the signboard. The upper line is written in the Ainu language, the middle is English and the lower is Japanese. In this house, I was given a lesson about the history and daily life of the Ainu from a member of staff. There were about 200 tourists in the house, but mostly Korean. Though the Korean group had an interpreter the speaker himself added some Korean words in his talk and his speech was interesting and very enjoyable. If allowed, I wanted to hear the story about the forced migration by Stalin just after World War Two, though the speaker might have intentionally wanted to avoid the political story. The Ainu people were forced to move from Sakhalin to Hokkaido by the Soviets. If the Korean people had heard that story, they would feel sympathy with the Ainu because Korea had just the same experience. 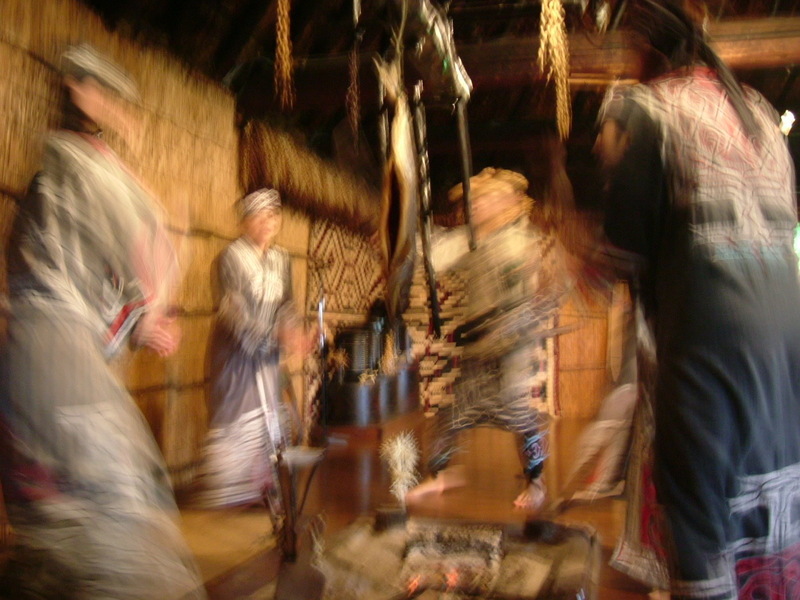 I took a picture of an ethnic Ainu dance, but their movement was so fast. The picture is what you see. We were sitting on the front row. A, my daughter, was always away from me. She was sitting 1.5 meters apart. There was room for about two people to take the seats between us. A Korean man seemed to want his daughter to sit between us from a casual glance backwards. I tried to say "Do you want your daughter to sit here?" in Korean, but I couldn't. My Korean was no use in the extreme situation that requires the exact words. My words were "앉으세요" meaning "Take a seat please!" It was not wrong, but wasn't exactly what I wanted to say. I explained that the girl was my daughter and she didn't like me and was sitting apart with my poor Korean skills. I hope he really understood me. At any rate, the words are kind of tools to communicate with each other. If you can't use the tool at the moment you want to use it, the tool is no use at all. I realized that reading the grammar book slowly at the desk is not sufficient to enjoy chatting in Korean. It was a good opportunity. A is eating soft ice cream at the POROTO (big lake) lakeside. As I wrote above, there were many Korean tourists in Porotokotan, but there were few foreign people in the historical village of Hokkaido. Porotokotan is not a historical heritage site but an amusement facility, whereas in the historical village there are many real houses that were actually used. I wondered why the Korean group chose to come here, not the historical village? I should have driven my car enjoying the idyllic scenery around here, but... there was a sudden change in the weather. The rain started to come down in sheets just before Toyako Lake. 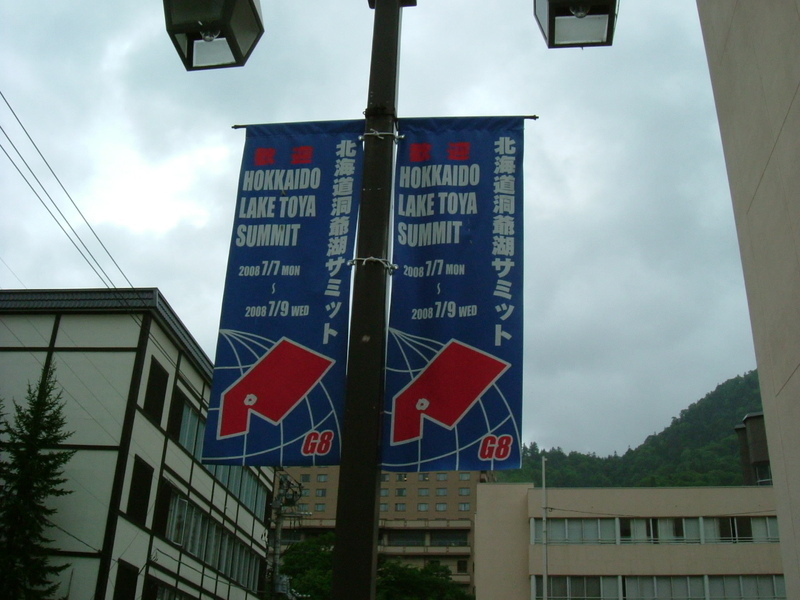 We were going to call at the Windsor Hotel TOYA Resort & Spa which is the conference site of the next G8, but I gave up. The heavy rain was one of the reasons. The other is that the hotel was not on our map. The hotel was built recently and the map in our car was not updated. I had a cellphone and could have called the hotel, but I was too lazy to do so. I'd like to have had coffee in the lobby and taken some pictures around there to show them off next year during the G8 meeting. 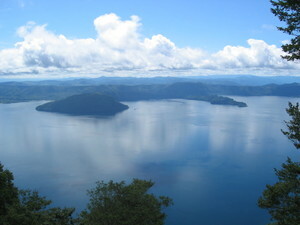 I supposed that we couldn't have enjoyed the scenery of Toyako Lake from the lobby. There were two sites I wanted A to see around here. One is the crater of the volcano, Mt. Usu. I'll show you two pictures near the crater. Take a look at the 1st picture. Do you recognize the road traffic sign? It stands for the speed limit (50kph) around here. You will find a fence between the road and the walkway. The oblique area between the fence and the signpost used to be the road. Look at the other picture. You can see the horizontal road on the near side and this road is winding to the right on the far side. Besides, this road is going diagonally down. There's a pond on the sagging road that was made by the eruption of the volcano. Such dynamic scenery can't be seen in any other place in Japan. This is the reason why I took A there. However, to my sadness, she seemed not to be interested in the activity of the volcano. I visited here last year, but I wanted A to see it and went again. Next, we left for Mt. 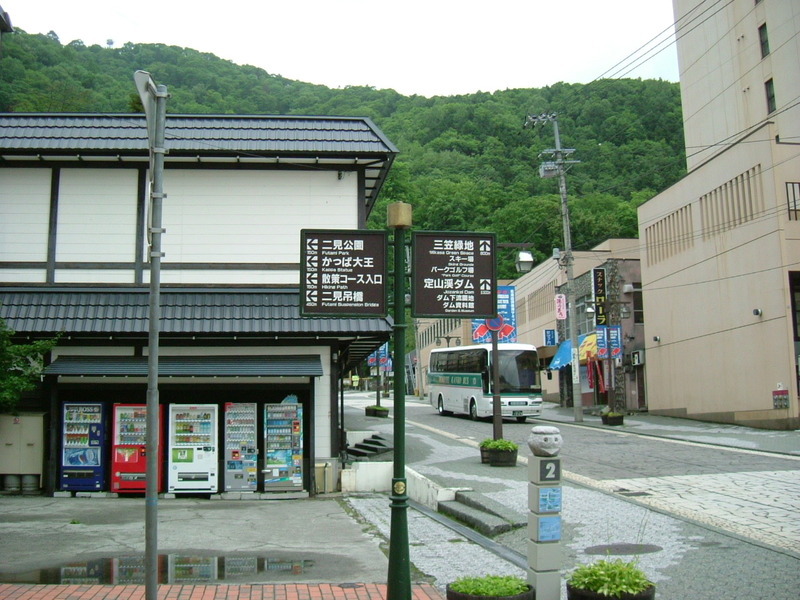 Showashinzan (398m). 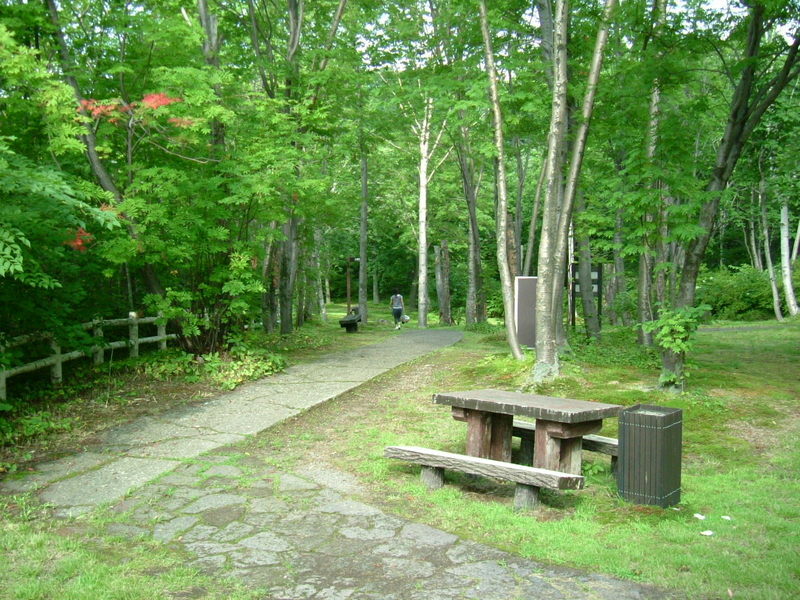 This is a very famous attraction too in southern Hokkaido. This had been heaved up and made over 2 years. I can easily imagine that people were astonished by it. Talking about A, she didn't look happy standing in front of the mountain. I didn't know why. Because she is a girl? Generally speaking, women might have less interest in earth science than men. We had lunch at the small restaurant near the parking lot. The lunch was so-called Sapporo ramen. Hokkaido is also noted for its ramen, but this ramen was lousy. After that we made for the Ainu Museum, POROTOKOTAN. We got back to our hotel and finished breakfast. The breakfast was good and was sufficient. It was cloudy during our walk, but it got better when we headed for Mt. Yoteizan. I thought we were lucky, but as we got over Nakayama Pass, the weather got foggy. Though I expected a magnificent view of Mt. Yoteizan and wanted A to see it, we couldn't. I suddenly got sleepy. It might be from a full stomach. I pulled my car over and took a nap. This picture was taken at that time. If the weather had been clear, you would have been able to see the beautiful Mt.Yoteizan beyond my car. 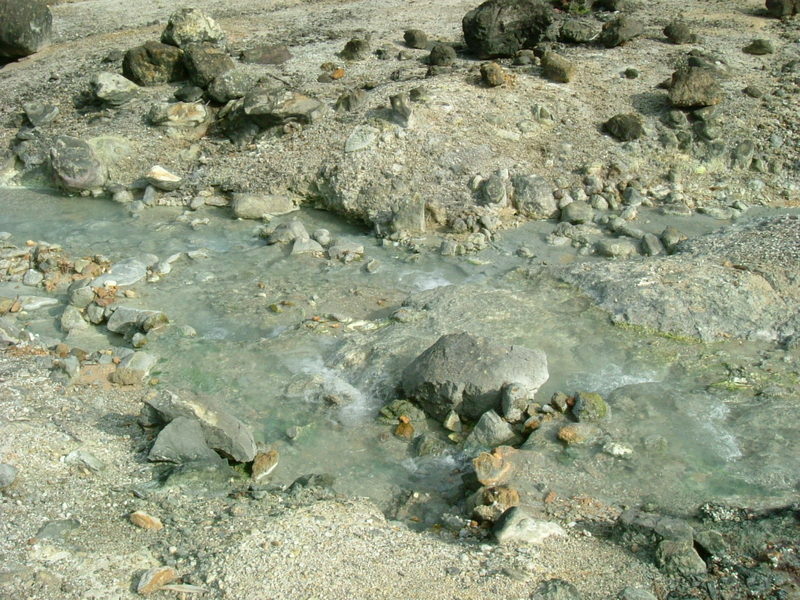 In these pictures you can see the mineral water spewing out of the ground. Here is the base of Mt. Youteizan. I usually spend the same old everyday life and am involved with modern civilization. People who lived around here centuries ago might have had a more healthy life with this unpolluted water. When I see such a scene for a change, I wonder which is the better life. Additionally, I visited here last year with my bike freak. (http://kumo.typepad.jp/weblog/2006/08/spewing-water-p.html) I didn't think that I would be here again this year. A is walking in the center of this picture. A was attending the lecture in the Agricultural Department while I was wandering in the Historical Village. The time I promised to see her was at 5 o'clock. I'm not good on geograpy around Sapporo and so I had to leave the village early enough, but I couldn't. I was so interested in the papers and books that were displayed in the storage room of the old clinic. An anatomical drawing of bulbus oculi attracted my attention. 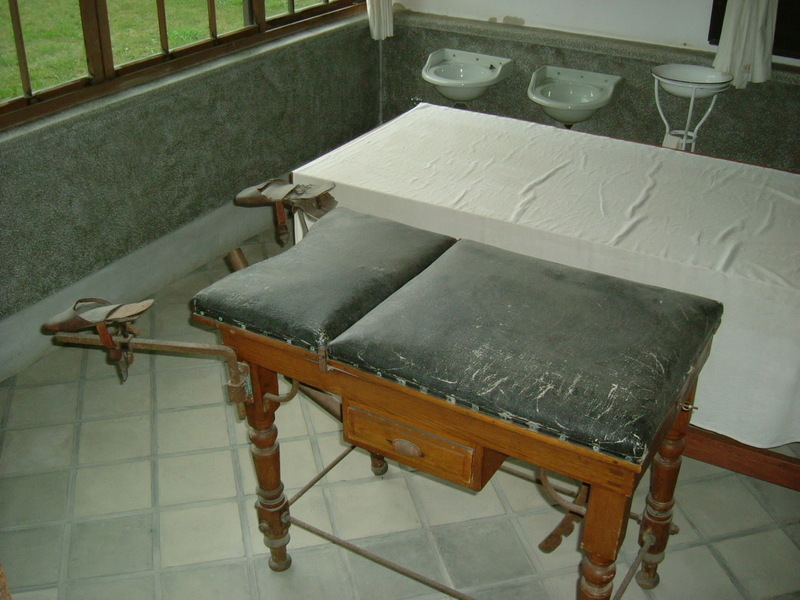 It was primitive, but I felt the tireless efforts of the medical student. 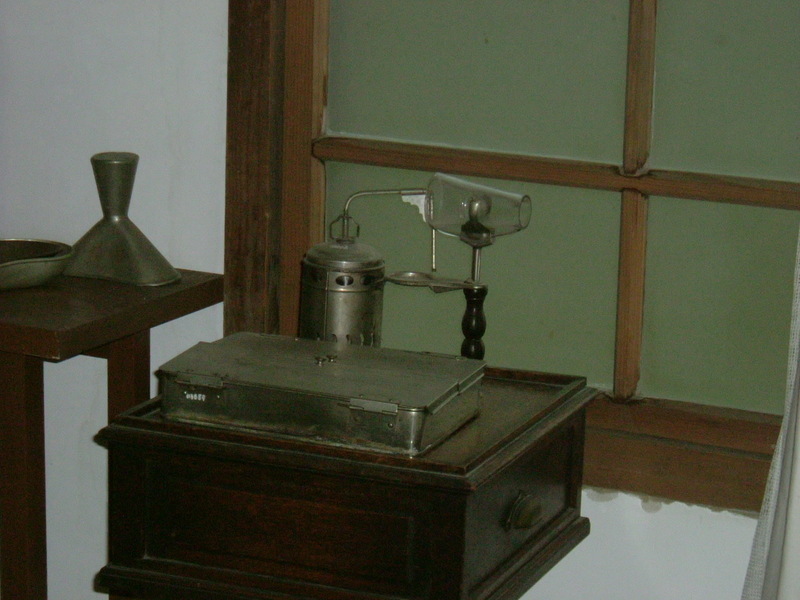 The medical charts, prescriptions, bills for medicines, , , all of them were from 70-100 years ago. It was fantastic for me to look at them directly, and not by pictures. Anyway, I started for Hokkaido University. My car was in good condition and the navigation system worked very well. I reached the meeting point just in time, but she wasn't there. I was afraid that she might be lost. It's because she is terrible with directions. I tried to call her, but the cell phone was shut down. Finally I had to wait for about 1 hour to see her. She seemed to have been talking with members of staff of the university. As soon as I saw her, I yelled at her, "You should call me if you are late." At any rate, we started for Jozankei Spa, but the traffic conditions were terrible in the rush hour. We got to the hotel at 7:00. Our hotel was the Jozankei Spa Hotel, the biggest and oldest in this area. We took the cheapest room, but the dinner was good. Japan is a small country, but I'm happy to enjoy hot springs everywhere in the country. 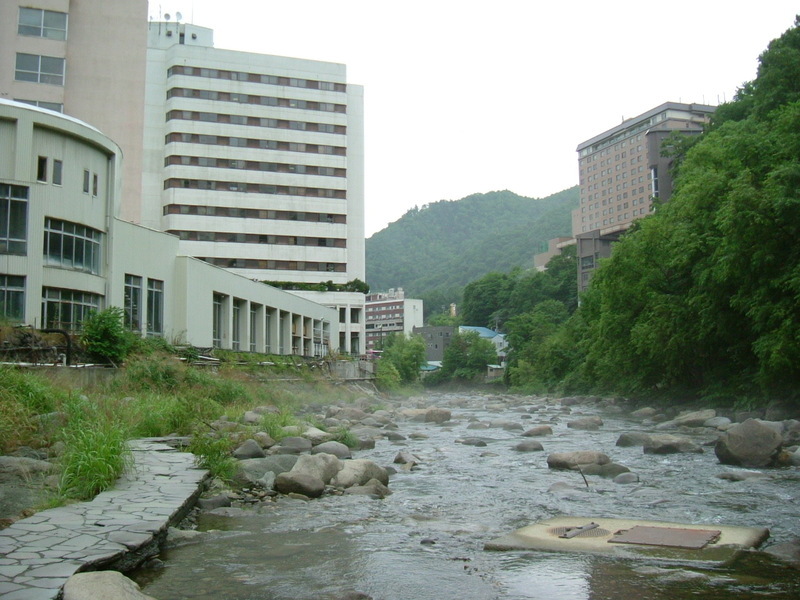 Our hotel is located on the riverside of Toyohira River. There was a walkway around here, but we didn't walk, because of being hungry. I wished I could have stayed a few more days here. It's early in the mornig. There was no one on the street and the shops were still closed. The next G8 will be held near here. We were going to call at the hotel that is supposed to be the conference site and take a coffee break. Two structures were moved from Furubira, Shiribeshi district. 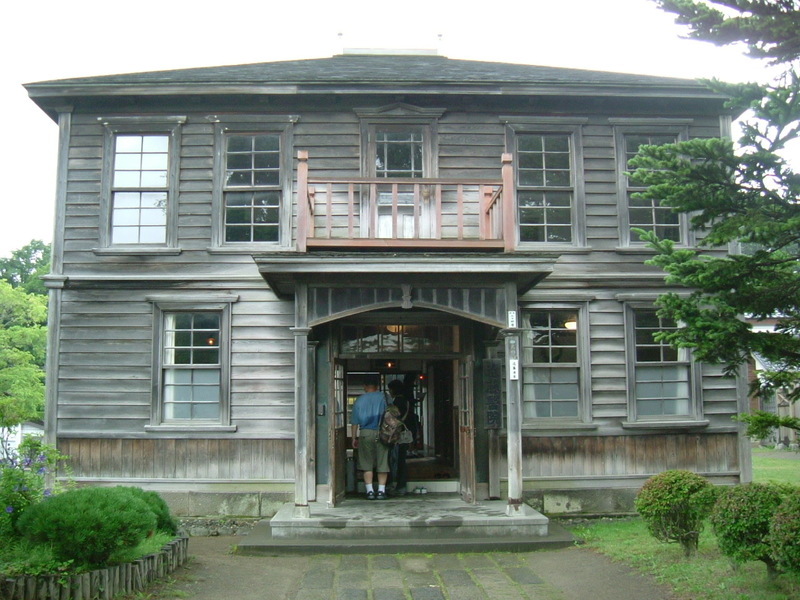 The main wooden house, designed by Dr. Seikichi Kondo himself, was built in 1919 and was a novel western style building for the district at that time. The attached stone storage house, built in around 1900, was used as his library. These were actually in use until 1958. Looking at this building, I had the feeling that I had seen it. I felt nostalgic and felt like seeing inside. I didn't have any time left,but I got into the building. It's a medical inhaler and you boil water in the bottle. The patient with some respiratory illnesses could inhale the vapor and this would relieve the dyspnea. 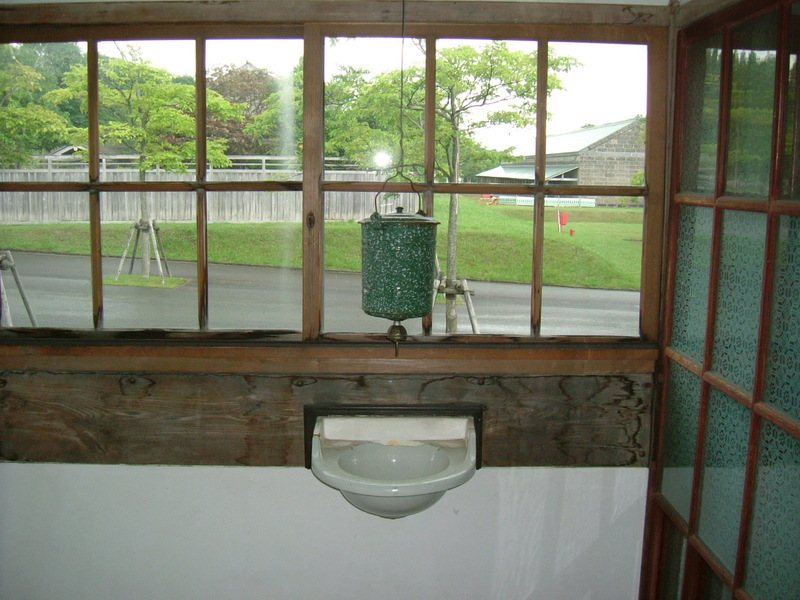 This device is very old and not in use in present day Japan. So, you'll wonder why I know how to use it. It's because I had sometimes seen this in use. The hospital director of the hospital that I was working for until 3 years ago had often made the patients inhale a vapor by using this inhaler. Because I knew that there were many other inhalers which were up-dated and are more effective now, I often advised him in vain to use a newer technique for the treatment. He didn't accept my opinion. He was around 85 years old and stubborn. I think he should stop working as a surgeon. He is a person who serves as an example of how not to behave. I got many lessons from him. It's important to know when to pull back. This display reminded me of these things. Tables for operation and delivery. I had the feeling that I had seen it in the infographic topping of the textbook of surgery. Can you see the bottle hanging from the ceiling? Can you tell what it is for? Yes, it is kind of water supply system. You push the switch under the bottle and water comes out. It was very commonly seen when I was before school age. 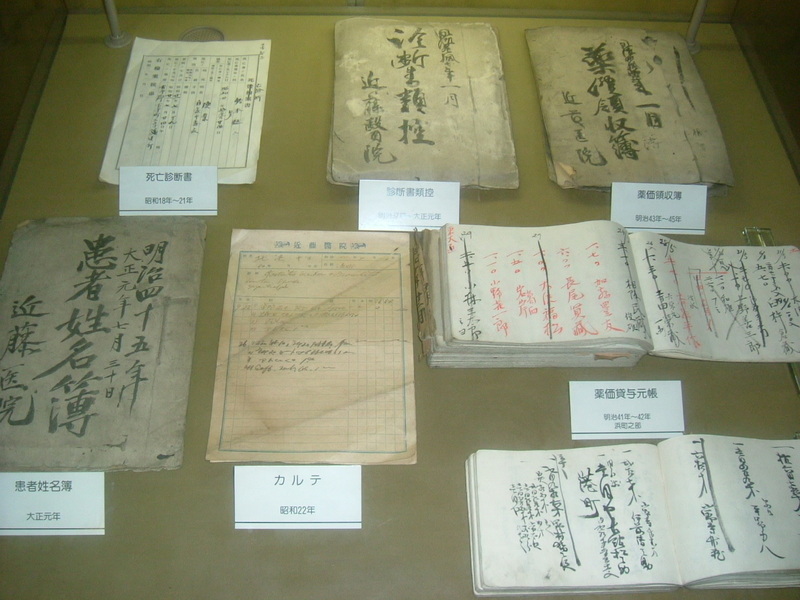 Many kinds of papers needed for the management of the clinic in Meiji, Taisho and the early Showa era were on display. Those were very interesting to me. The transcript of a lecture was written with a writing brush. 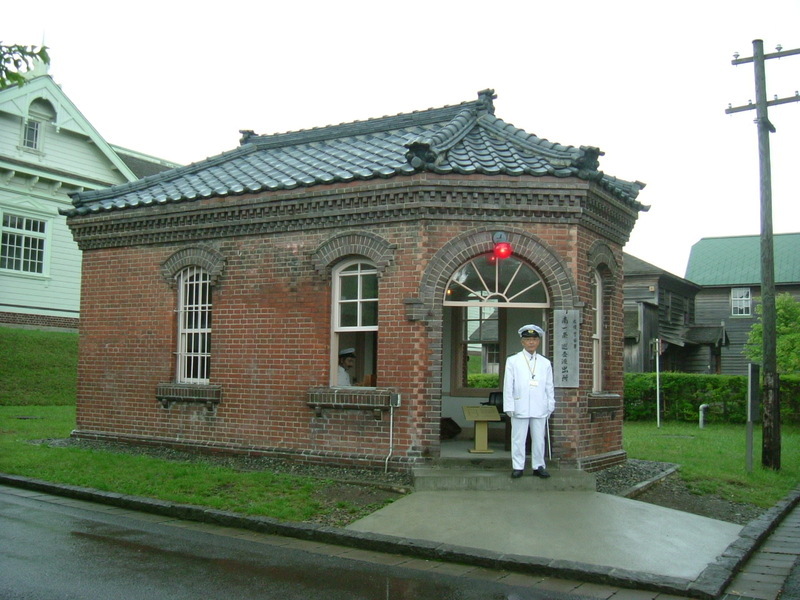 A policeman stands in front of the police box with a white uniform which was the policeman's uniform in Meiji era. Because I took him for a mannequin looking at him from a distance, I was astonished to be spoken to by that mannequin while I was passing by this building. He was a volunteer guide of this village. Incidentally, the policeman sitting in the house was a mannequin.